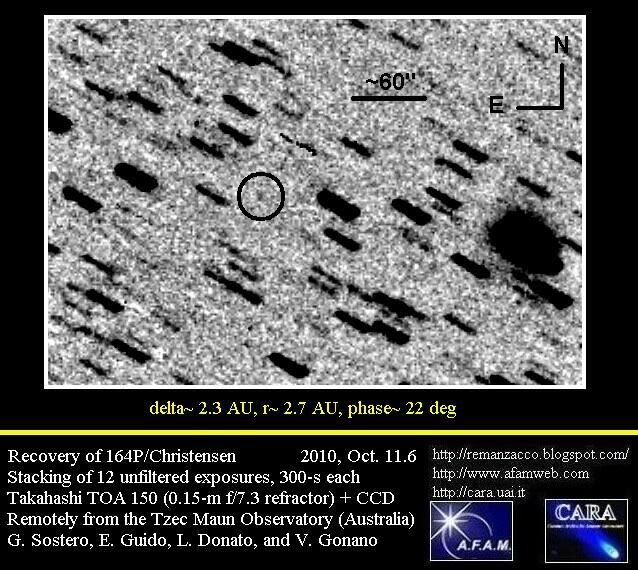 According to the current ephemerides, comet C/2010 X1 (Elenin) promises to became a nice binocular object at the end of next summer. As for many new comets, there is still some discussion about the maximum brightness this comet might actually reach. 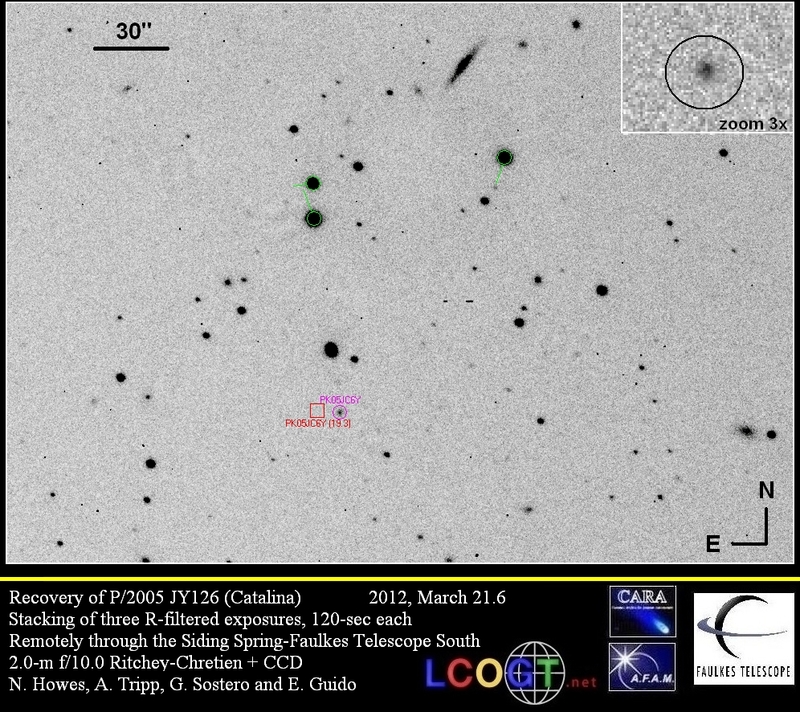 In order to provide further elements to the discussion, on 2011, March 14 we dedicated a few observing hours to C/2010 X1, using a couple of scopes kindly provided by the Tzec Maun Foundation: a RCOS 16" Ritchey-Chretien + CCD (located near Mayhill, NM) and a Takahashi TOA-150 f/7.3 refractor + CCD (located near Moorook, Australia). 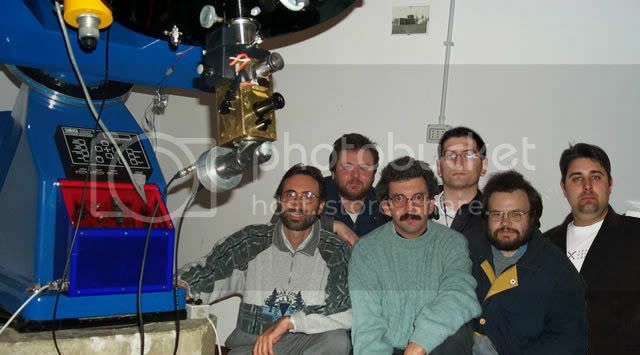 We used V and R photometric filters, and a selection of different calibrated reference stars (Tycho catalogue). 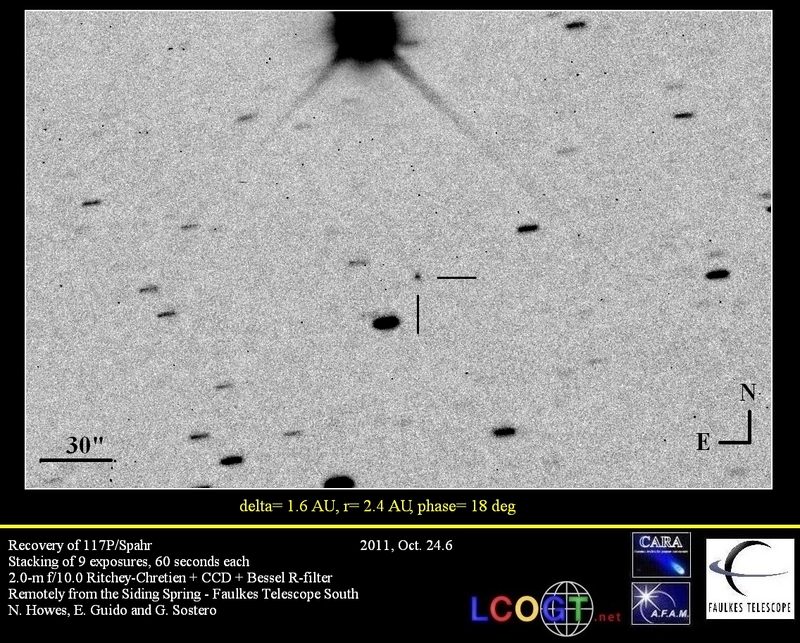 The first analysis indicate a compact coma about 15 arcsec in diameter; within such aperture, we measured the following magnitudes: V= 16.7, R= 16.5, with an uncertainty about 0.5 magn in each color (photometry of faint comets is always a tricky business, so this data must be taken anyway with a certain amount of caution). 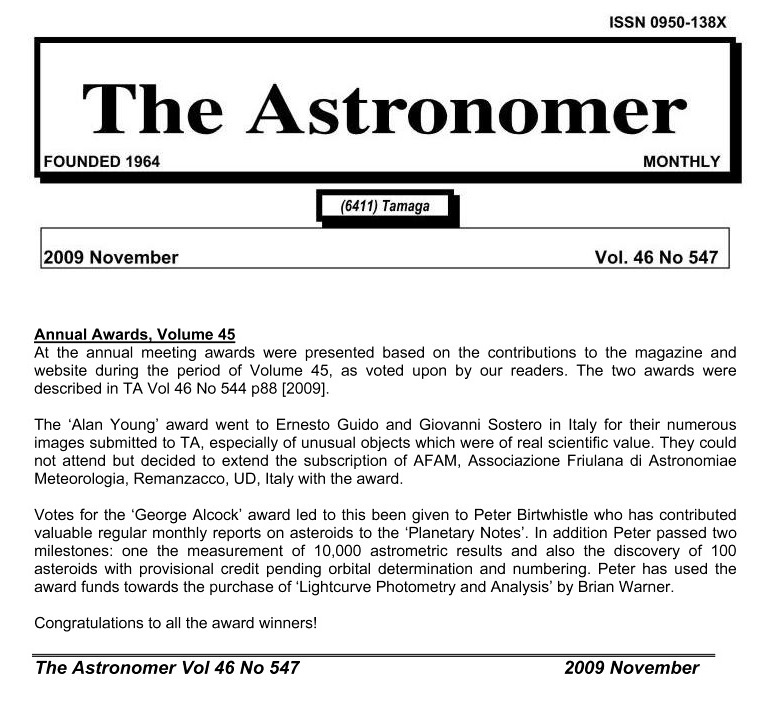 The afrho parameter (proxy of the dust abundance within the coma) measured through an R-bessel filter, is close to a value 100 cm. 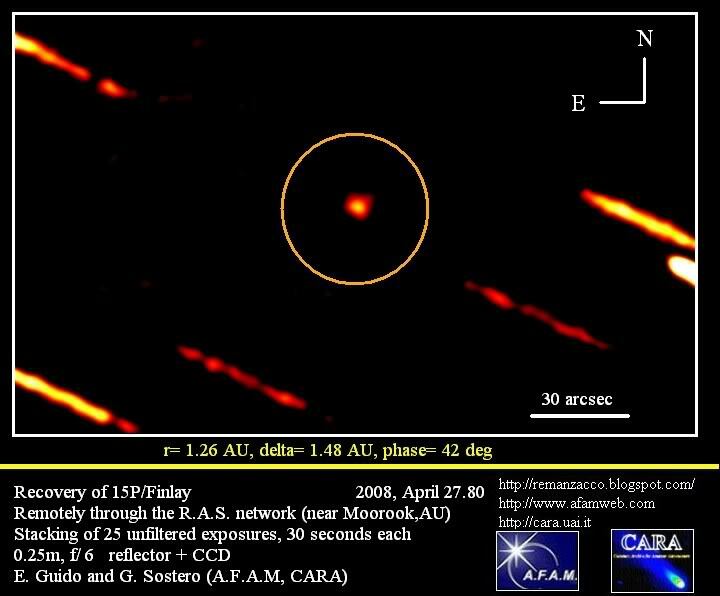 Considering that the comet was about 3 Au from the Sun, this seems to indicate a relatively active object. 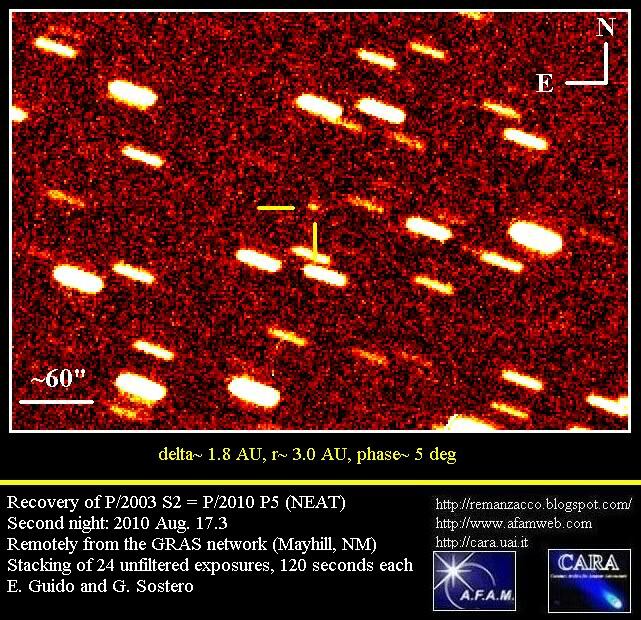 It is always very risky to extrapolate the behavior of a newly discovered comet, expecially if it has a long period orbit, however we can say that, if its trend will continue this way, we might expect indeed a nice comet a few months from now. Probably a key factor will be the efficiency of water ice sublimation within the nucleus, that is expected to rise significantly in the next few weeks, when the comet will approach our star. When the first visual estimations will be available, it would be possible to prepare a more reliable forecast about C/2010 X1 brightness peak. IAUC nr.9202, issued on 2011, Mar. 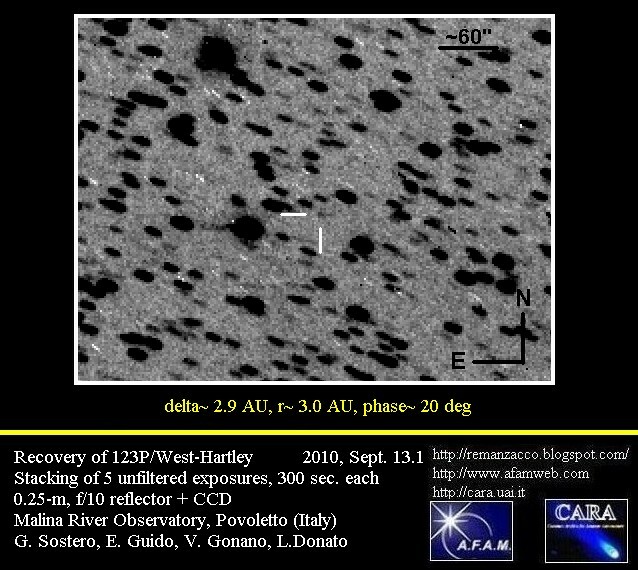 21, announced the discovery of a new comet (discovery magnitude 18.3) by the LINEAR survey through their 1.0-m f/2.15 reflector + CCD, on images obtained on 2011, Mar. 17.3. 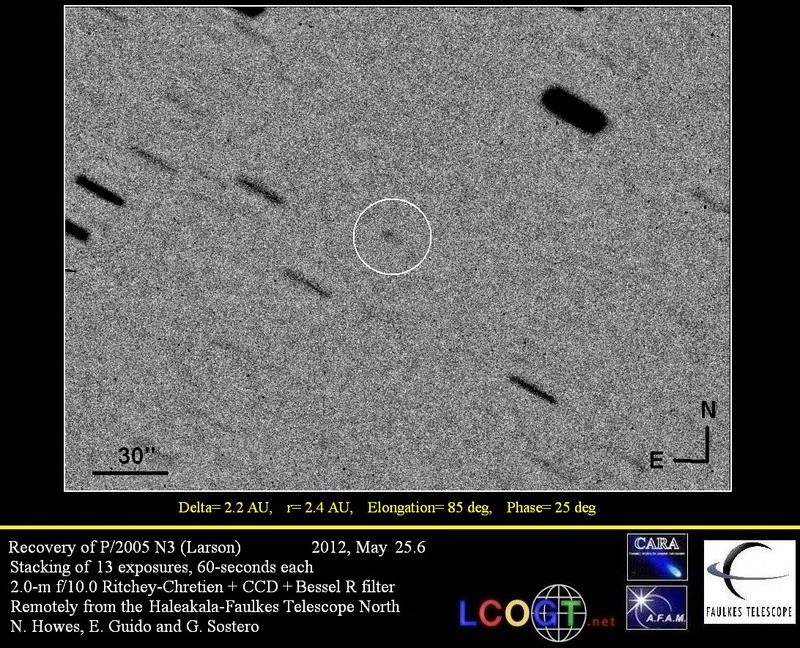 The new comet has been designated C/2011 F1 (LINEAR). 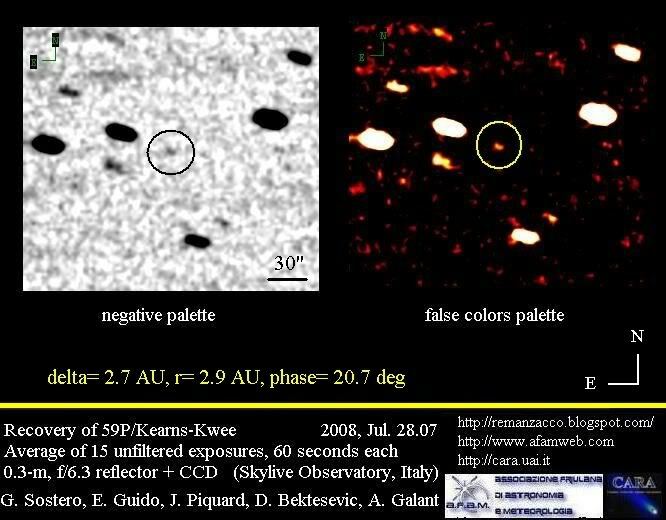 After posting on the Minor Planet Center's 'NEOCP' webpage, this object has been found by several CCD astrometrists to show cometary appearance. 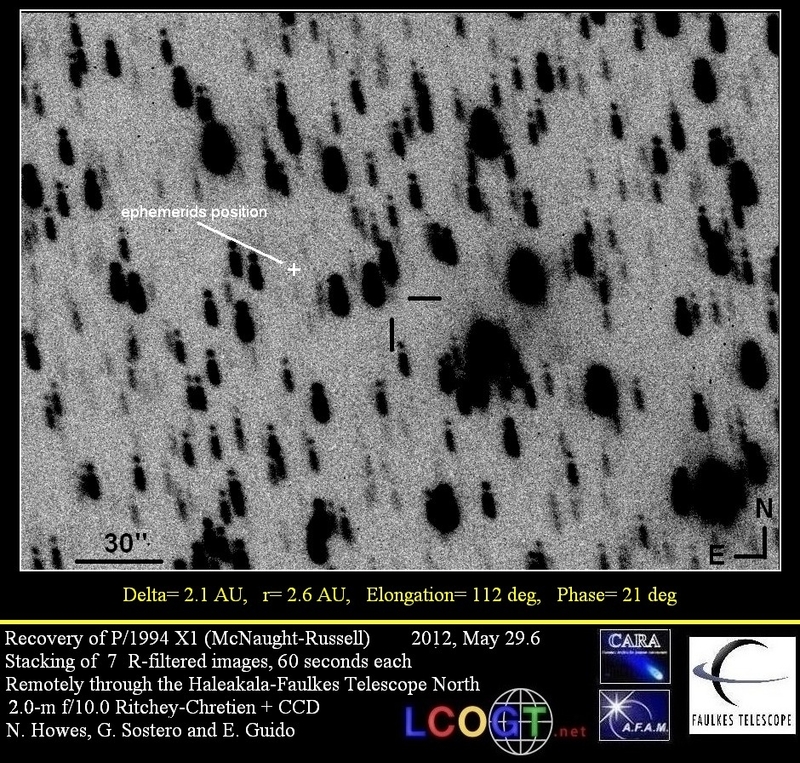 We performed some follow-up measurements of this object while it was still listed in the NEO-CP, on 2011 Mar. 18.45, remotely both from the GRAS Observatory (near Mayhill, NM) & from the Tzec Maun Observatory (near Mayhill, NM). This comet may reach at least 9th magnitude at perihelion. 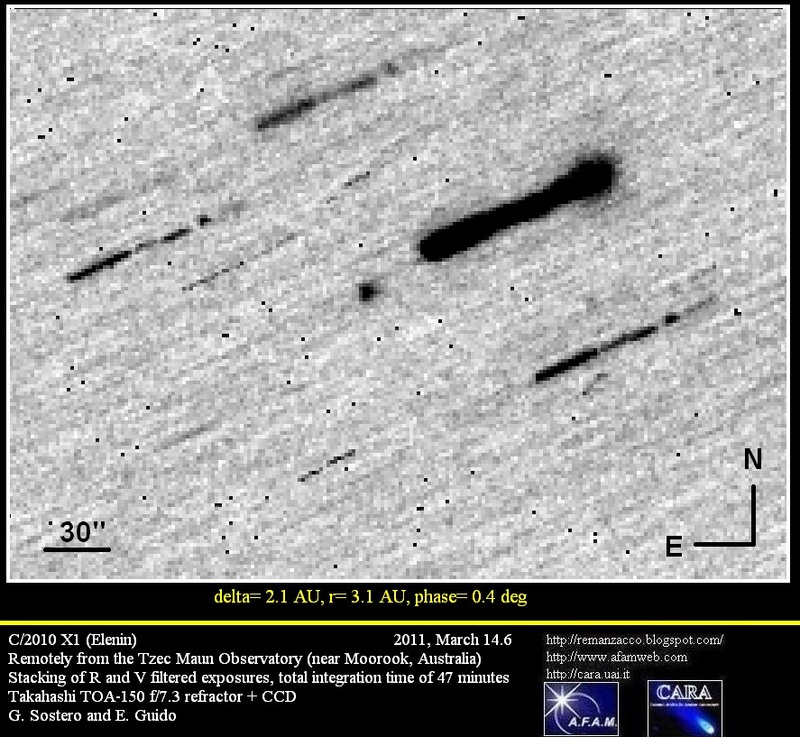 According to COCD webpage, this is the 202th comet discovery for LINEAR Survey.